Far from the comfortable ghettos of Hong Kong, where expats burn their fat salaries in drinks and high calories dinners, lives Shu Fang, 85, still working full time. She is a misplaced element of a very interesting sub-environment in the city: the newspaper trophic chain, where old citizens have been recycled into performing very hard jobs instead of enjoying a well deserved pension. 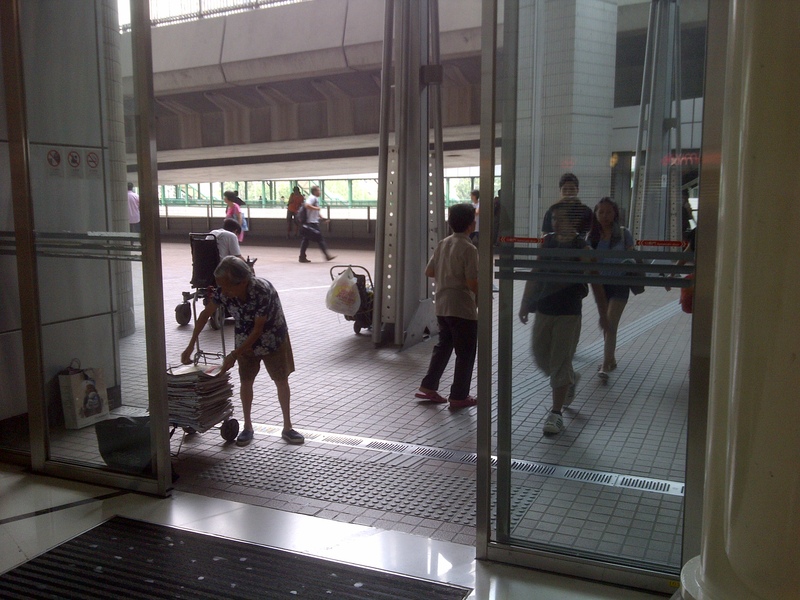 A number of old people in Hong Kong queue every morning to get the daily newspaper. Curious about the long queues under the high temperatures I ask them about the purpose of the wait. It seems like the news inside are less important than the paper that can later be sold for recycling. They bring big bags, and they are eager to fill them up. Only one newspaper is given at a time, but they have the whole morning to get back to the queue and wait for their next paper. 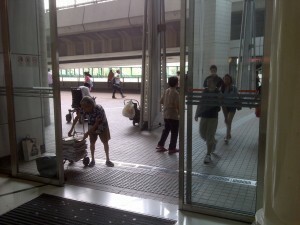 Many of the people who give them out are also seniors hired for the purpose. They know each other well, they play every morning the same absurd fast recycling game. But they do it for a good cause: their survival. Shu Fang has a more traditional and honest strategy. 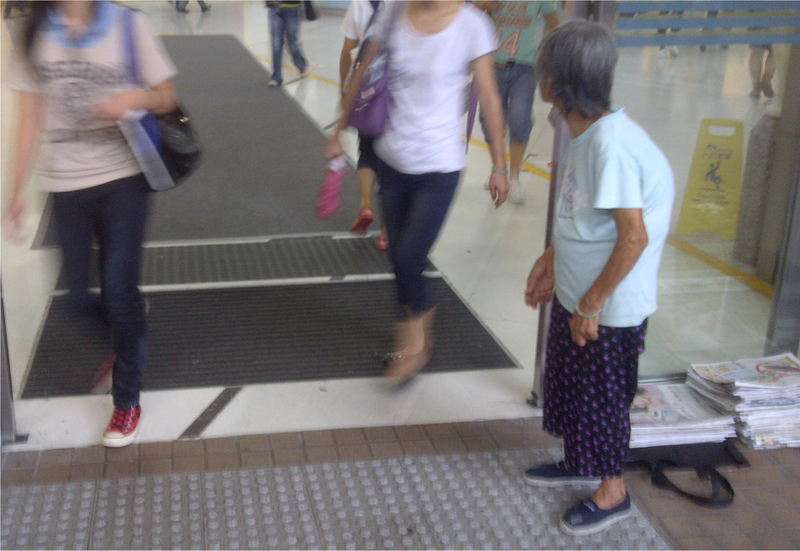 She stands at the entrance of Tsing Yi subway station, where she waits for actual newspaper readers to hand in her their used newspaper. She is small and her figure is skinny and arched, but her eyes are big and the expression on her face is full of tenderness. She looks vulnerable standing among the crowd of people in the station. But she is vigilant, waiting for the next newspaper to predate. She cannot miss one, as the income she gets from reselling paper is just enough for living. She wakes up at 5, and at 6 goes with some friends to exercise at the promenade. I’ve never seen such group of women moving their hips so energetically. But she hurt her back after years of hard work, so she cannot do much, she just hangs out with them to get some company for a while. And then she takes her space at the entrance of Tsing Yi MTR, to watch how newspapers are delivered, consumed and recycled in minutes. She doesn’t like it, but she needs to do it. What else could she do? As there is no social security in Hong Kong, she is not getting any income from the government, not even after her husband died. According to Chinese culture, her only son should be responsible for taking care of her, but they don’t get along, so she is alone. 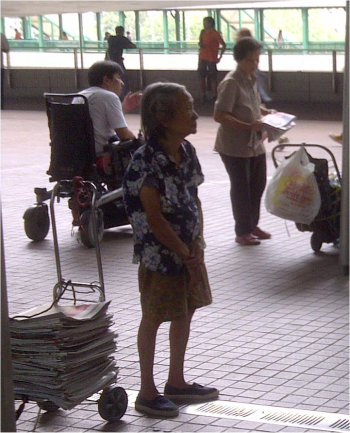 She finds it hard every time bending down to pick up the newspapers, and she is not allowed to be inside the air conditioned area of the metro, so she has to stay at her place outside, suffering the hot and warm Hong Kong weather. She is a symbol and a heroine of an unbalanced society. The investment bankers in Hong Kong island don’t think for a second about people like Shu Fang, as they are too busy looking after the pension plans of the very rich citizens, or otherwise pouring their bonuses on the many Hong Kong opportunities for hedonism. That hedonism that Shu Fang will never know about, as she doesn’t even know how to read the many newspapers she collects every day.